Who would ever have thought just a few decades ago that the Maritime provinces of Canada (Nova Scotia, New Brunswick and Prince Edward Island) would one day be viewed as potentially distinguished wine-producing areas? Recent developments in eastern Canada are not really that surprising, as we have seen this happen time and again. As a result of the world’s burgeoning interest in wine and trailblazers planting new vineyards on every suitable piece of soil (and at times on less suitable ones too), not to mention the positive effects of climate change, places that were once better known for beer, rugby, French fries, windmills and tulips are now becoming bonafide wine-producing areas. For example, England is now producing excellent sparkling wines. Not just locals but even prestigious Champagne houses have bought land there recently, attracted by the chalky soils and cool climate of areas like Surrey and Kent. Did you know that Belgium and the Netherlands now boast hundreds of wineries? At the opposite end of the temperature spectrum, wine is now being produced in Equatorial Africa too--in Senegal, no less. Clearly, wine can imbue men and women everywhere with wondrous levels of passion, commitment and energy. While wines produced in some of these far-flung, unexpected locales can at times be of suspect quality, this is not the case with Canada’s Maritimes, a truly bucolic landscape the rugged beauty of which is hard to translate into words. Once associated mainly with salmon fishing, lobstering and a love for ice hockey, the Canadian Maritimes are now producing still wines from numerous grape varieties as well as some of the country’s most interesting sparkling wines. That this part of Canada is capable of coming up aces in sparkling wine production shouldn’t be surprising, given the generally cold climates of these provinces. Currently, it is Nova Scotia that is most closely linked with fine wine production in the Maritimes. The province includes seven distinct grape-growing areas, of which the most famous is Annapolis Valley. Some of the other better-known areas are Malagash Peninsula, LaHave River Valley, Avon River Valley and Bear River Valley. When walking Nova Scotia’s vineyards, you are never more than 20 kilometers from the ocean, a reminder of why the province’s motto is “Canada’s ocean playground.” The combination of proximity to the sea, geologically complex soils, and very cool climate makes possible the production of unique wines of considerable potential. There are currently more than 70 grape growers and over 800 acres of vines planted across Nova Scotia, and about 25 wineries (just think that as recently as 2004, Nova Scotia only had six grape wineries and three fruit wineries). Some of these outfits still produce wines typical of very cold environments (such as fruit wines made from the likes of blueberries, strawberries and cranberries and wines made from grape hybrids such as Marechal Foch, Baco Noir, Leon Milot, Mischurnitz and Severnyi have largely been abandoned), but other wineries have achieved remarkable success with Vitis vinifera varieties such as Chardonnay, Pinot Noir and Pinot Gris. In fact, Nova Scotia is strongly associated with a specifically Canadian grape hybrid, L'Acadie Blanc (Cascade x Seyve-Villard 14-287), which is also found in small quantities in Ontario and Quebec. The grape variety, originally named V.53261, was created in 1953 by grape breeder Ollie A. Bradt at the Horticultural Research Center of Ontario (now Vineland Research and Innovation Centre). Subsequent trials were performed at the Agriculture Canada station in Kentville, Nova Scotia in 1972. Roger Dial was also given some cuttings as he was testing numerous varieties in his own vineyards (the grape’s early ripening and extreme winter resistance were clearly of interest to Nova Scotia farmers). He had remarkable success with it, making a delicate, Sauvignon Blanc-like wine, and it was Dial who named the variety L’Acadie, the historic French name of Nova Scotia and New Brunswick (actually, it was an Italian cartographer, Bolognini Zaltieri, who in 1566 first named this part of modern-day Canada “Arcadia,” or “Acadia”). Today, L’Acadie Blanc is an important part of Nova Scotia’s only Appellation wine, Tidal Bay. Given the province’s cold climate, it’s not surprising that some estates have experimented with appassimento-styled wines too, in the manner of Italy’s Amarone. In fact, winemaking isn’t a recent event in Nova Scotia. Grape-growing has been documented in the province since the 1600s; it was one of the first spots in North America where grape cultivation took place. In 2002, the Winery Association of Nova Scotia was created to help the fledgling wine industry promote and develop their wines. The Nova Scotia Wine Standards were agreed to by the association’s members in 2005 and the Nova Scotia Farm Wine policy was established in 2007. These guidelines were developed with the goal of promoting quality wine production in Nova Scotia. Commendably, the guidelines can be quite strict: for example, while wines simply labeled as “Nova Scotia” (or Product of Nova Scotia) must be made with at least 85% grapes grown within Nova Scotia’s political boundaries (the other 15% can come from anywhere in Canada), to use the “Wines of Nova Scotia” logo or carry the words “100% Nova Scotia grown” on the label, or to have the wine sold in the “Wines of Nova Scotia” section of a retail wine store, the wine needs to be made with 100% Nova Scotia grapes. Most of the grape-growing is done in the Annapolis Valley, and the nearby Gaspereau and Avon Valleys. North Mountain, a long ridge, shields the south-facing slopes from strong, cold northerly winds. The nearby Bay of Fundy, famous for the highest tides in the world, creates air currents that greatly reduce the risk of frost at both the start and end of the growing season. Nova Scotia’s soils are also varied. For example, the Wolfille formation soil (glacial till and coarse sandy loam on the surface, with deeper layers of clay ideal for water retention), found in only 3% of the province, seems to be especially ideal for quality viticulture. Specific viticultural sub-zones along the lines of France’s Appellations and Italy’s Denominazioni have not yet been officially established. Presently, wineries tend to use whatever geographical terms they feel are appropriate. Gaspereau Valley, Wolfville and Annapolis Valley are gaining in repute, but in fact most of those in the know would consider the first two to be sub-appellations completely contained within the third (Annapolis Valley). Further complicating matters, there are significant climatic, soil and exposure differences between, for instance, the lower Gaspereau and the upper Gaspereau Valley (the latter is located at a higher altitude and is farther from the moderating influence of the Minas Basin at the head of the Bay of Fundy). Actually, there are also terroir-related differences between the south-facing and north-facing slopes of the Gaspereau, but given modern Nova Scotia’s young history of winemaking, such diversity is not yet consistently obvious in its wines. So it seems likely that it will take many years before any such sub-appellations are established. That said, I do hope Nova Scotia’s legislators do not miss out on the opportunity to move forward relatively quickly, because my experience is that you either perform zonation studies and establish sub-appellations early in the wine game or it becomes virtually impossible to do so at a later date. Human nature being what it is, once commercial and financial interests have been established, these tend to prevail, making it almost impossible to take appropriate decisions with regards to appellations. For evidence, you have to look no farther than Montalcino, the Sonoma Coast AVA or the Brand grand cru in Alsace, all of which are far too large to allow for homogeneous wine production of true quality. The production of icewine, a Canadian specialty, has also been regulated, with the guidelines stating that “. . . only Nova Scotia-grown grapes naturally frozen on the vine, pressed in a continuous process while the temperature is -8°C or lower” can be used. In other words, no low-quality shortcuts can be taken, such as freezing the grapes in an icebox. Finally, Nova Scotia has also established its own signature wine appellation called Tidal Bay; these wines are blends of aromatic and non-aromatic vinifera and non-vinifera varieties (the latter have to comprise at least 51% of the blend). Today, there are about ten wineries making a Tidal Bay white in Nova Scotia. These wines are lightly aromatic, uncomplicated but very fresh and flavorful, ideal as aperitifs or with simply cooked appetizers and fish dishes; they pack in quite a bit of flavor given their low 11% alcohol. New Brunswick’s wine industry is very small (at least a dozen wineries to date). It is essentially a cottage industry, with most outfits making wine mainly from cold weather-resistant hybrids like Frontenac, Seyval, Vidal, Marechal Foch and Baco Noir (all French) or Sabrevois, Prairie Star and Raddison (all from Minnesota), but also from fruits such as blueberries and strawberries. Because of the warm waters of the Gulf of St. Lawrence, Prince Edward Island (PEI for short), the smallest Canadian province both in terms of size and population, has generally a warmer climate than parts of the Canadian mainland. Winters are cold, with January mean minimum and maximum temperatures ranging from -12°C to -3°C (10.4°F to 26.6°F). Summers are moderate, with mean minimum and maximum temperatures that run from 14°C to 23°C (57.2°F to 73.4°F) in July and August. July and August are the driest months in the year (with roughly 32 inches of rainfall a year, PEI can be humid). There are several outfits making wine currently, mainly from fruit and grape hybrids, although at least one winery, Matos, has planted Gamay and Chardonnay and makes wine with these vinifera varieties. 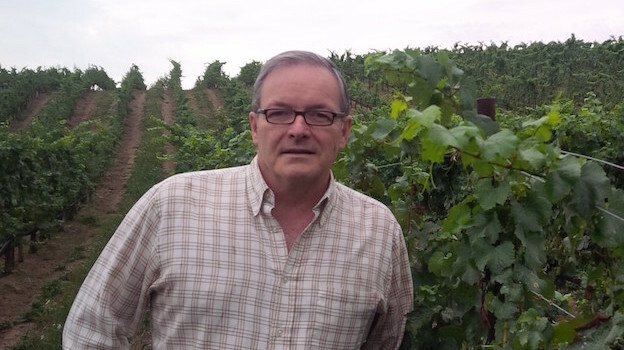 Peter Gamble, who graduated from Ontario’s Trent University in English and Philosophy, is one of Canada’s historic wine figures and is very closely linked with Maritime wines. He became mildly interested in wine during his first year of college and by his third year he had read every book on wine that he could find. “It got to the point where, I started reading books in French, because I had gone through all the available literature in English,” he told me in July. “And that was hard because I didn’t speak French then!” Gamble has played an important role in Canada’s modern wine industry since its beginning, making one of the country’s first icewines, and working at such different estates as Ontario’s Newark winery (back in 1980; it later became Hillebrand) and Stratus. He served as the first Executive Director of the newly formed VQA (Vintner’s Quality Alliance, the government organization responsible for the definition and establishment of Canadian winemaking standards and for maintaining the integrity of provincially designated wine appellations, at least in Ontario and B.C.). After leaving that post in 2000, Gamble quickly became a much sought after consulting winemaker, specializing in winery start-ups. Interestingly, one of Gamble’s longest working relationships has been with Nova Scotia’s Benjamin Bridge winery, which he has helped to reach the pinnacle of Canadian sparkling wine production (today, he also crafts the wines at Lightfoot & Wolfille, another premium Nova Scotia winery). “I remember when Gerry McConnell, Benjamin Bridge’s owner, called me out to Nova Scotia to take a look at his property,” he said. “It didn’t take me long to figure out that I wasn’t going to make any world-class Cabernet or Merlot wines there, but I also realized that Nova Scotia’s Gaspereau Valley is one of the rare wine-production areas of the world with a growing season very much like Champagne’s. A bonus is that the valley’s cool climate and geography result in extremely low natural crop levels. So I told him, I like what you have in mind and I think this area actually has considerable potential, but for sparkling wines, not big, bold reds. So if you’re game, I am too.” McConnell obviously was, and the rest, as they say, is history. The wines in this article were tasted in Toronto and Niagara in July, 2016. In this report, I have covered only Maritime wines made with vinifera varieties, but in the future I hope to review well-made wines made with hybrids too. I plan to visit the Maritimes and their wineries next summer and look forward to reporting on more wines and estates from this as-yet little-known corner of the wine world.